Grab your keys in a New York minute. Your tools? Let Texas hold 'em. 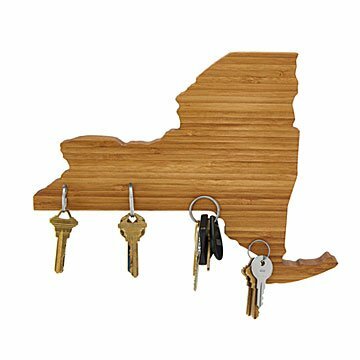 These state-shaped magnetic holders feature four hidden, super strong neodynium magnets that grab any magnet-friendly items you want to keep handy. Each bamboo state silhouette is easy to hang in a foyer or mud room with either adhesive strips or screws (both included). Choose from popular states currently offered or check back for additional states as they become available. Handmade by Ben and Christen Aroh in Louisville, Kentucky. Read more about how Ben came up with his fun, functional solution for storing keys on the blog. Ben and Christen run a small woodworking shop in Louisville, Ky. Ben handles product design and production; Christen keeps everything organized and running smoothly. They met in college three years ago, around the same time that the first wooden state was created (in the shape of Kentucky nonetheless). Cut by hand from some scrap walnut, it was created as a playful solution to a problem Ben encountered quite frequently -- leaving for class, forgetting his keys. After a successful crowdfunding campaign, the company was able to purchase the necessary equipment and begin the journey of building a business. Can be hung with adhesive or screws (both included). Only gave it a small demerit because the map had 4 magnetic places to hang keys, and I wish it had a few more. Otherwise, an excellent gift. They should include more than one key ring with this product because the key rings we tried to use does not stay on the magnet so will be useless if they have more than 1 set of keys. I love that it is hand made right here in the USA, and you can read the story behind the craftsmanship on the website. Hold lots of key rings easily. My friends loved it. I just received this as a gift! It is BEAUTIFUL and so well made. The wood is gorgeous and I can't wait to hang this where everyone can see it. This product is amazing. The wood is such good quality and it's very sturdy with holding everything the recipient uses it for.